This homemade costume for girls entered our 2011 Halloween Costume Contest. My daughters (4 and 2) are a Peacock and a Flamingo. The idea came from my four year old after reading Eric Carle's book, "Polar Bear, Polar Bear what do you hear?" where there are children dressed up as different animals. She really wanted to be a peacock, and so going along the 'bird' theme, the youngest got to be a flamingo. The costumes are handmade by me. I'm a bit early..but wanted to get their costumes ready so they could enjoy wearing them before Halloween too. The materials used for the peacock: Blue headband, black felt, 6 peacock feather, 2-3 blue boas, 1 wooden hand fan, blue paint, two assorted turkey stemmed feathers, hot glue gun, and blue ribbon long enough to go around waist and tie a bow in front. INSTRUCTIONS: For the headband: cut one of the six peacock feathers and attach with the other two turkey stemmed feathers by wrapping with a bit of felt and gluing well. Use a rectangular piece of felt to attach the headpiece to the top of the headband. Hot glue some blue boa feathers over the felt to cover. For the back: paint the wooden fan blue and allow to dry. Thread the ribbon in the fan and hot glue well. Cut up a piece of the felt for one side of the wooden fan and glue on, it can cover the bottom half (where the back touches) so it's comfortable. On the other side, glue the 5 remaining peacock feathers and use cut up pieces of boa to cover. Add some leftover feathers to the tip of the ribbon too. For the skirt I used a blue skirt my daughter already had and simply looped boa pieces through the belt loops. Materials for the flamingo: pink heaband, one large pink feather, 1 large pink boa (2 yards), wooden fan, pink paint, pink ribbon, pink felt, hot glue gun, pink tights, onesie and pink sparkly shoes (already had). INSTRUCTIONS: Hot glue the pink feather and about three inches of the feather boa along one side of the headband for the headpiece. Paint the wooden fan, allow to dry and thread the ribbon and hot glue in place. Just as for the peacock, attach a piece of felt on one side for the back of the fan. Hot glue pink boa pieces to the other side and some at the tip of the ribbon. Yay!!! Hoping it wins! Thanks for the support. Any help spreading the word would be greatly appreciated. Thanks in advance! Great costumes, you're girls are adorable! I love that they had this idea on their own. When I accompanied them, wearing their costumes, to a halloween party, they received a lot of compliments.These costumes are very cute and original. I love them. Katherin, they look so cute!! And such a creative idea for two sisters ;)They look so happy wearing the costumes! 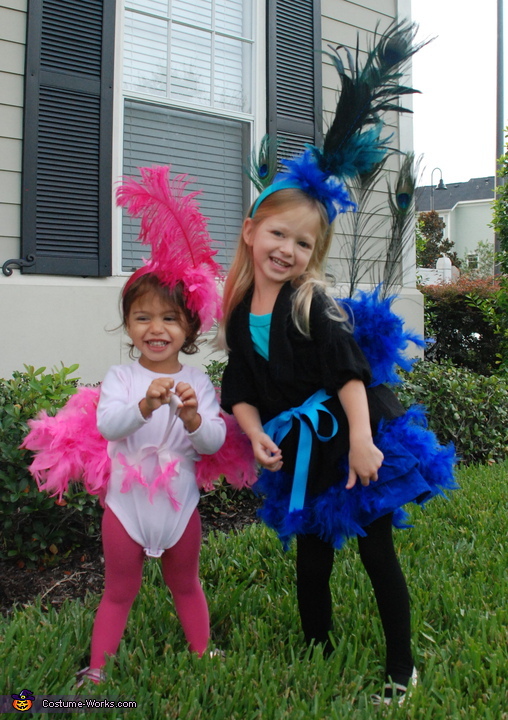 These costumes are so pretty with all of the feathers, great job :) Very creative! And they do look so happy wearing them. Very original, an uncommon theme which includes the nature, very suitable as Floridians, besides the beautiful smiles with spontaneous expression. Thanks for all the encouraging comments!! The most important thing is that I thoroughly enjoyed making these costumes and seeing my daughters enjoy them! thanks again!